T cells respond to external signals by altering patterns of gene expression. Our characterization of a transgenic mouse revealed a genetic locus that is specifically regulated in T cells. Elucidation of the factors controlling the expression of the marker transgene may reveal basic regulatory mechanisms used by T cells as they differentiate from naive to primed/memory T cells. Although endogenous MHC class I Kq expression is normal in these animals, expression of the Kb transgene differentiates naive from primed/memory T cells. KbHigh T cells bear the phenotypic and functional properties of primed/memory T cells, while KbLow T cells have naive phenotypes. The transition from KbLow to KbHigh appears to involve signals resulting from engagement of the TCR. We show that transgene integration has occurred on chromosome 1, between D1Mit365 and D1Mit191. The gene regulatory mechanisms directing expression of the locus marked by the transgene are distinct from those controlling other known T cell-related genes within this locus. Stimulation of KbHigh T cells results in the up-regulation of both the endogenous Kq gene and the Kb transgene. However, the same stimuli induce increased expression of only Kq on KbLow T cells. This indicates that even though the transcription factors necessary for class I expression are present in KbLow T cells, the Kb gene appears not to be accessible to these factors. These findings suggest a change in chromatin structure at the transgene integration site as cells progress from a naive to a primed/memory differentiation state. From its beginnings in the thymus until its death in the periphery, a T cell will experience many changes. It will undergo several rounds of proliferation in response to various stimuli, change its surface phenotype several times, and will alter the expression of a number of genes. Activation markers CD44 and CD25 are examples of genes whose expression by T cells is dynamic (1, 2, 3). An immature T cell precursor does not express these markers, but will gain expression in response to signals it receives during thymic development. As a thymocyte completes its maturation program, expression of these genes wanes. After it exits the thymus and undergoes activation events in the periphery, the T cell is again cued to express CD44 and CD25. Although the expression kinetics of the two genes are not identical, the expression patterns provide evidence of the dynamic response of the T cell to its environment, reflecting gene regulatory changes occurring within the T cell. The regulatory changes governing gene expression during each phase of a T cell’s life are not fully understood. Several groups have analyzed global gene expression patterns in resting, activated, and memory CD4+ and CD8+ T cells (4, 5, 6). Though these studies provide insight as to which genes are differentially expressed by subsets of T cells, they are limited by the spectrum of genes represented on their respective DNA microarrays. We have generated a MHC class I transgenic mouse that identifies a locus differentially regulated by immature, naive and activated/memory T cells. Expression of the transgene does not correlate with the expression of other known genes relevant to T cell biology within this locus. We examined whether the class I transgene is a marker for regulatory events that occur at different stages of T cell development and activation. In this study, we describe the characterization of this transgenic mouse and its potential for identifying important genetic changes that are tightly regulated by T cells as they transition from immature/naive cells to primed/memory T cells. Transgenic mice were generated in the Mayo Transgenic Animal Core Facility. The Kb transgene was generated from an EcoRI digestion of genomic DNA. This 10-kb fragment contains the Kb gene and its endogenous promoter as well as a 3.7-kb region that is upstream of the Kb promoter. Eight transgenic founders were screened for transgene expression by staining peripheral blood with an anti-Kb Ab followed by analysis using flow cytometry. Seven founders expressed Kb similar to endogenous Kq (referred to as FVB-Kb). We discovered one founder (referred to as FVB-KbTc) in which the Kb transgene was differentially expressed by CD4+ and CD8+ T cells. FVB-KbTc mice were crossed to DO11.10 mice (The Jackson Laboratory). The resultant F1 animals were backcrossed to DO11 or BALB/c mice. Abs recognizing CD4, CD8, Kb (AF-6), CD44, CD62L, CD25, CD69, Ly6C, and CD45RB were obtained from BD Biosciences (BD Pharmingen). Additional Kb-specific Abs were generated from the B8-24-3 and K-10-56 hybridomas. Spleens, lymph nodes, and thymi were harvested from mice, homogenized, and depleted of RBC using a hypotonic solution. PBMC were isolated using Ficoll gradients. Cells were stained with the appropriate Abs and surface marker expression was analyzed using flow cytometry. In experiments when comparisons were made between stimulated and unstimulated cells, cells were treated with supernatant from the 2G4.2 hybridoma (American Type Culture Collection (ATCC)) which is specific for the FcγR. This procedure lowers the background staining for anti-Kb Abs and fluorescently labeled secondary Abs. In all analyses, forward scatter was used to gate on live cell populations. Expression of Kb is similar on cells isolated from spleen, lymph nodes, or peripheral blood. To determine the phenotype of mice generated from crosses with DO11.10 mice, we used the KJ1–26.1 Ab that specifically recognizes the DO11.10 TCR (7, 8). T cells were enriched from splenocytes and lymph node cells by passage over nylon wool columns or using mouse CD3+ T cell columns (R&D Systems). T cells were labeled with an anti-Kb Ab (B8-24-3) for 15 min on ice, washed twice, then labeled with rat anti-mouse IgG1 microbeads (Miltenyi Biotec) according to the manufacturer’s protocol. Cells were washed twice then loaded onto magnetic columns. Cells that flowed through the column were collected as the KbLow fraction. The column was then removed from the magnet and cells were flushed out and collected as the KbHigh fraction. This isolation procedure results in a KbHigh and KbLow T cell preparation that was >80% pure. DCs were prepared by culturing RBC-depleted bone marrow progenitors in the presence of GM-CSF and IL-4 for 7 days as previously described in Ref. 9 . On day 6, OVA (1 mg/ml) was added to the DC cultures. OVA-loaded DCs (1 × 106) were injected into the footpads of FVB-KbTc mice. Control mice received PBS injections into the footpad. Six to 8 wk after immunization, KbHigh and KbLow T cells were harvested from mice and were tested for their ability to proliferate in response to Ag via thymidine assay (see below). A total of 1 × 105 T cells were cultured with 2 × 105 irradiated feeder splenocytes in the presence of titrating amounts of OVA (1–0.001 mg). Cells were pulsed with [3H]thymidine on day 3 and harvested on day 4. T cells from immunized mice were cultured in EHAA medium (Click’s; Sigma-Aldrich) media containing 10% horse serum to reduce background proliferation associated with Ags from FCS (a component of the media used to culture dendritic cells). Cytokine secretion by cells stimulated with 0.3 mg/ml OVA for 60 h was quantified using the mouse Th1/Th2 Cytokine CBA (BD Biosciences). Cells were harvested and purified from mice as described above. Cells were cultured either in the presence of Con A (3.5 μg/ml) for 48 h or were plated on 48-well plates that had been coated with anti-CD3 plus anti-CD28 for 48–60 h. Abs were coated onto plates the night before by adding anti-CD3 (H57 clone, a gift from Dr. D. McKean, Mayo Clinic College of Medicine Rochester, MN; 1 μg/ml) and anti-CD28 (BD Pharmingen, 0.5 μg/ml) in 500 μl of PBS overnight at 4°C. The next morning, Abs were aspirated from wells and wells were washed three times with PBS before loading cells into wells. Cells are cultured in RPMI 1640/10%, IMDM/10% or EHAA medium (Click’s) plus 10% FCS at 37°C for 48 h. Kb transgene expression on stimulated and unstimulated cells was evaluated using flow cytometry as described above. FISH analysis was performed by the Cytogenetics Laboratory within the Department of Laboratory Medicine (Mayo Clinic, Rochester, MN) as previously described (10). Splenocytes from FVB-KbTc mice were stimulated with Con A (as described above) to be used in the generation of metaphase chromosome spreads. The full-length Kb transgene was fluorescently labeled with Alexa Flour 495 (Molecular Probes) using the Vysis nick translation kit. Spectral karyotyping analysis was accomplished using SkyPaint Probes (Applied Spectral Imaging) according to the manufacturer’s protocols and using the manufacturer’s reagents, instrumentation, and software. Phenotypic screening for expression of the Kb transgene by backcross offspring was analyzed by flow cytometry as described above. Genomic DNA was isolated from FVB-KbTc, DO11, and BALB/c mice using phenol/chloroform extractions followed by ethanol precipitation. It is important to note that the DO11.10 strain is on the BALB/c background and FVB-KbTc mice are on the FVB background. Therefore, we refer to a genotype as FVB or BALB/c, not DO11 or FVB-KbTc. Primer sequences for microsatellites were obtained from Mice Genome Informatics (〈www.informatics.jax.org〉). PCR products were resolved on 4% agarose gels. Microsatellite positions on chromosome 1 were obtained from 〈www.ensembl.org〉. RNA from KbHigh and KbLow T cells was isolated using the RNA-STAT reagent (Tel-Test). KbHigh and KbLow T cells were isolated as described above. Three separate T cell purifications (six mice per purification) and RNA isolations were performed on 3 different days. The Microarray Core Facility (Mayo Clinic) performed RNA hybridization to Affymetrix 430A arrays (Affymetrix) according to the manufacturer’s protocol. We used six 430A chips, hybridizing KbHigh mRNA to three chips, and KbLow mRNA to the remaining three chips. Data analysis was accomplished using the Affymetrix Microarray Suite (version 5.0) software. The expression of a gene is measured by hybridization of RNA molecules to a probe set, or a set of paired oligonucleotides. This software uses statistical algorithms to determine, based on the hybridization signal relative to internal controls, whether a gene is expressed (called present) or not expressed (called absent). While addressing the role of MHC class I molecules in a virus model, we generated transgenic FVB (H-2q) mice expressing a Kb transgene. The transgene was generated from an EcoR1 digest of genomic DNA and contains the full-length Kb gene and all of the known upstream regulatory elements. Seven founders expressed the Kb transgene at uniform levels comparable to the endogenous Kq gene (referred to as FVB-Kb mice). We discovered one founder, referred to as the FVB-KbTc mouse, in which CD4+ and CD8+ T cells differentially expressed the transgene (Fig. 1⇓B). Non-T cells (CD4−CD8− cells) in this mouse expressed the transgene at normal levels, similar to the expression pattern of their endogenous class I genes (Fig. 1⇓A and data not shown). Expression of a Kb transgene in FVB-KbTc mice is bimodal on T cells. A and B, Kb expression was analyzed on PBLs from FVB-Kb and FVB-KbTc mice by flow cytometry. Expression was analyzed on total PBLs (A) or on CD4−CD8− non-T cells, CD4+ T cells, and CD8+ T cells (B). Thymocyte development can be broken down into stages identifiable by the expression of the CD4 and CD8 coreceptors (1). The most immature thymocytes express neither CD4 nor CD8. As thymocytes develop they gain expression of both CD4 and CD8 and subsequently commit to the expression of either CD4 or CD8. It was of interest to us to determine transgene expression on subsets of developing T cells within the thymus. To address how the KbTc transgene is expressed in the thymus, we first determined whether expression on thymocytes was similar to its endogenous homologue Kq (Fig. 2⇓A). Kq and Kb expression on thymocytes is similar in the double-negative and double-positive stages of development, but was divergent on cells that had committed to the CD4 or CD8 lineages. Normally, class I expression is up-regulated on CD4 and CD8 single-positive T cells, but Kb expression on these cells in FVB-KbTc mouse remained low. Low expression of Kb is not an inherent property of the transgene because the Kb transgene is expressed on single-positive thymocytes from other transgenic founders (Fig. 2⇓B). The gene regulatory events which result in the differential expression of the Kb transgene must be unique to the FVB-KbTc strain, and likely are the result of integration site-specific events, first revealed as T cells are positively selected in the thymus. Differential expression of Kb on developing T cells does not occur until late thymic development. A, Thymocytes from FVB-KbTc mice were analyzed for Kb (bold line) or Kq (light line) expression on double-negative (upper left), double-positive (upper right), and CD4+ (lower left) or CD8+ (lower right) populations by flow cytometry. B, FVB-Kb and FVB-KbTc mice were analyzed by flow cytometry for Kb expression on single-positive thymocytes. Interestingly, both the peripheral CD4+ and CD8+ T cell compartments appeared to be comprised of two kinds of cells, KbHigh or KbLow. The general proportions of KbHigh and KbLow T cells (∼10–30% and 70–90%, respectively, Fig. 3⇓A) correlated with the general proportions of naive to memory T cell subsets (11, 12). Consequently, we addressed whether Kb transgene expression correlated with any other memory markers. On the basis of activation marker expression, naive T cells can be classified as CD44LowCD62LHigh, while activated/memory T cells are identified as CD44HighCD62LHigh/Low (2, 13, 14, 15). We analyzed the expression of these markers on KbHigh and KbLow T cell subsets (Fig. 3⇓B). Expression patterns of CD44 and CD62L suggested that KbLow T cells might be naive, predominately being CD44Low and CD62LHigh. KbHigh T cells, however, had an activated/memory phenotype; they were predominantly CD44High and had a mixed distribution of CD62L. Kb expression on T cells correlates with the expression of activation markers CD44 and CD62L. Flow cytometry of splenocytes from FVB-KbTc mice stained with Abs recognizing CD4, CD8, Kb, and CD44 or CD62L. 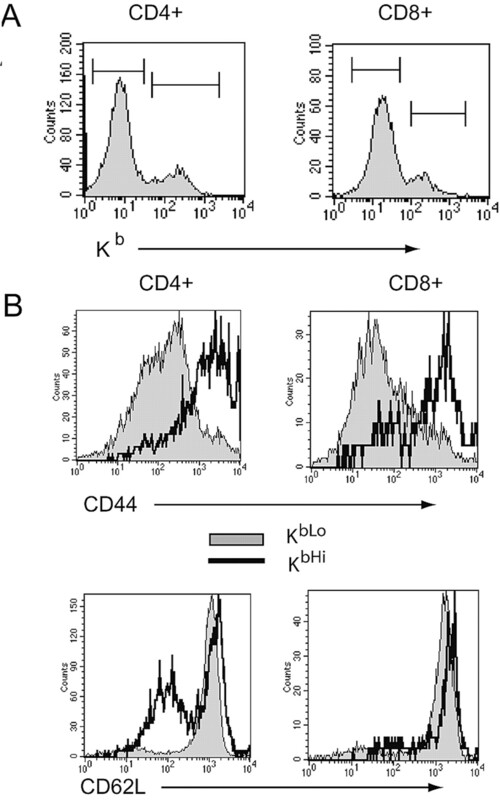 A, Histogram representations of expression of Kb on CD4+ (left) and CD8+ (right) T cells were used to establish gates on KbHigh and KbLow T cells. B, CD44 and CD62L expression was analyzed on KbLow (shaded line) and KbHigh (bold line) CD4+ (left) or CD8+ (right) T cells using the gates established in A.
CD44 and CD62L expression alone cannot distinguish between activated and memory T cells. Other markers, such as CD25, CD69, Ly-6C, and CD45RB are useful in making these distinctions (2, 16, 17, 18). Activated T cells are characterized by expression of CD69 and CD25. Memory T cells can be distinguished from activated cells based on the low expression of CD45RB and, in the case of CD8+ T cells, high expression of Ly6C. Freshly isolated KbHigh T cells did not express CD69 or CD25 and were CD45RBHigh/Low. 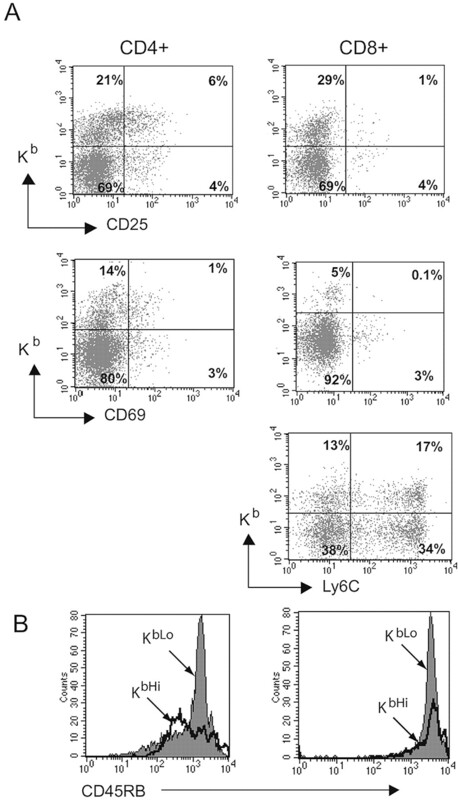 Furthermore, CD8+ KbHigh T cells were not exclusively Ly6CHigh (Fig. 4⇓). Therefore, Kb expression does not distinguish activated from memory T cells. Kb transgene expression in FVB-KbTc mice does not distinguish between activated and memory T cells. A, Flow cytometry of splenocytes from FVB-KbTc mice. Dot plots show comparisons of Kb expression with CD25 (top) and CD69 (middle) expression on CD4+ (left) vs CD8+ (right) T cells. Expression of Kb and Ly6C by CD8+ T cells is also shown (bottom). Numbers in each quadrant represent the percent of cells positive for the indicated marker. 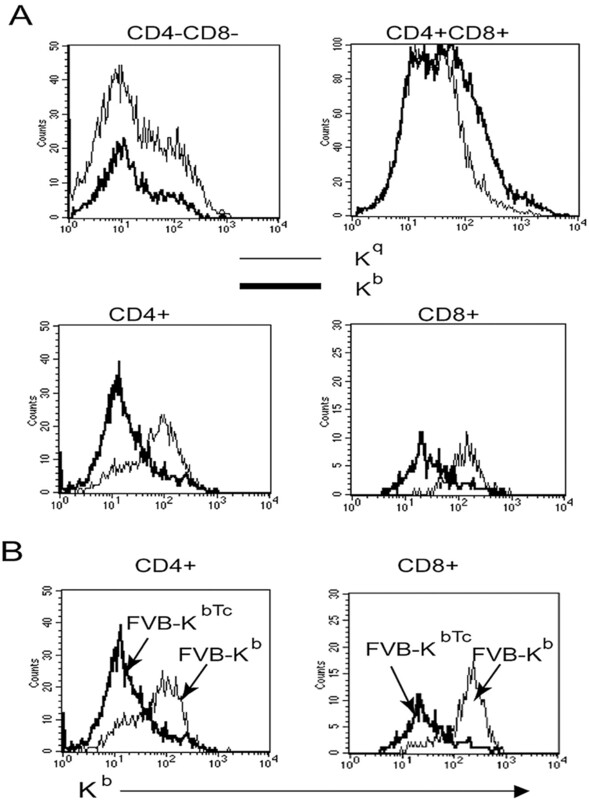 B, Expression of CD45RB on CD4+ (left) vs CD8+ (right) KbLow (shaded line) and KbHigh (bold line) T cells was analyzed using gates established as in Fig. 3⇑. Although CD44 expression correlated with Kb transgene expression, only 37–64% of KbHigh T cells were CD44High (Table I⇓). A greater proportion of KbLow T cells (83–92%) were CD44Low. In addition, expression of Kb did not completely associate with the expression of other activation/memory markers (Fig. 4⇑). Therefore, expression of the Kb transgene in the FVB-KbTc mouse does not completely correlate with any other known activation/memory markers and appears to be serving as an indicator of gene regulatory events other than those characterized by other activation/memory markers. Phenotypic analysis (Fig. 3⇑) suggested that transgene expression could distinguish naive T cells from memory T cells. We decided to evaluate whether this was true functionally. Memory T cells, in comparison to naive T cells, have the ability to respond more rapidly and robustly to their specific Ag (16, 19). Therefore, we immunized mice with OVA-loaded DCs, waited 6–8 wk, purified KbHigh and KbLow T cells from immunized mice, and compared their ability to respond to secondary stimulation. KbHigh T cells from mice immunized with OVA-loaded DCs proliferated more robustly than KbLow T cells from the same mice or KbHigh and KbLow T cells from mice injected with PBS (Fig. 5⇓). KbHigh T cells, therefore, functionally and phenotypically appear to have a memory phenotype whereas KbLow T cells functionally and phenotypically seem to be naive. KbHigh T cells exhibit a better recall response than KbLow T cells from immunized mice. FVB-KbTc mice were immunized with OVA-loaded dendritic cells in the footpad. Six to 8 wk later, KbHigh and KbLow T cells were harvested from immunized mice and nonimmunized mice and tested for their ability to proliferate in vitro in response to OVA. Cells were pulsed with [3H]thymidine on day 3 and harvested on day 4. We intercrossed FVB-KbTc mice with DO11.10 transgenic mice to study the regulation of transgene expression during an Ag-specific immune response. The DO11.10 TCR recognizes an OVA peptide in the context of MHC class II. Small numbers of T cells in DO11.10 TCR transgenic mice appear to have an activated/memory phenotype, despite the fact that they have not encountered OVA (12, 20, 21). Due to the fact that the DO11.10 mice are not deficient in expression of the recombinase-activating genes, a small percentage of T cells from DO11.10 TCR-transgenic mice are capable of expressing nontransgenic TCRs. T cells can even express a nontransgenic TCR and the DO11 TCR on the same cell (12). Activated/memory DO11 TCR+ T cells from naive DO11.10 mice have been shown to acquire their phenotype after encounter with enteric Ags in the gut through the second, nontransgenic TCR (22). In DO11.10 × FVB-KbTc mice, if the events resulting in transgene up-regulation were associated with TCR-mediated recognition events, then fewer DO11 TCR-positive T cells, in comparison to DO11 TCR-negative T cells, would convert from a KbLow phenotype to a KbHigh phenotype. Consistent with this hypothesis, we found small numbers of DO11+KbHigh T cells in the periphery of DO11-KbTc mice (Table II⇓). Interestingly, there were nearly twice as many DO11 TCR-negative KbHigh T cells than DO11 TCR-positive KbHigh T cells. This indicates that the transition from low to high expression of the transgene involves signals resulting from engagement of the TCR. We reasoned that if the Kb transgene in FVB-KbTc mice can be used to distinguish between naive and activated/memory T cells, then DO11 TCR-KbHigh T cells should be capable of mediating a memory-like response, even when the mice have not been preimmunized. As previously mentioned, memory T cells, in comparison to naive T cells, proliferate more robustly and secrete a wider rage of cytokines in response to Ag (2, 19, 23). When stimulated in vitro with OVA, purified KbHigh T cells proliferated more robustly than did KbLow T cells from FVB-KbTc × DO11 mice (Fig. 6⇓A). In addition, only KbHigh T cells were capable of producing IFN-γ in response to Ag, while both KbLow and KbHigh T cells produced TNF-α and IL-2 (Fig. 6⇓B). Hence, we conclude that the Kb transgene in FVB-KbTc mice serves as a surrogate marker for genetic events that follow activation signals mediated through the TCR and result in the generation of primed or memory T cells. TCR transgenic KbHigh T cells respond robustly to cognate Ag. DO11 mice were crossed with FVB-KbTc mice and the resultant F1 animals were backcrossed to DO11 mice. 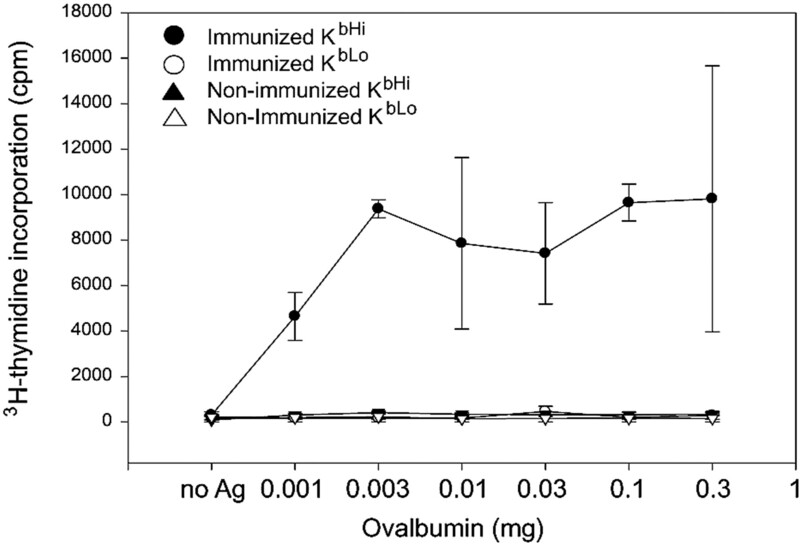 KbHigh and KbLow T cells were isolated from the spleens and lymph nodes of backcross offspring and were tested in vitro for their ability to proliferate (A) and produce cytokines (B) in response to OVA. A, Cells were pulsed with [3H]thymidine on day 3 and harvested on day 4. B, Supernatants were collected from cells that had been stimulated with 0.3 mg/ml OVA for 60 h. Cytokine production was measured using the mouse Th1/Th2 Cytokine CBA. Data are representative of two separate experiments. In vivo stimulation of T cells suggested that KbHigh T cells had arisen from KbLow T cells that had undergone activation and differentiation. To more directly address this possibility, we stimulated purified KbLow T cells in vitro with either Concanavalin A, or with plate-bound anti-CD3 plus anti-CD28 cross-linking Abs. Kb expression was not up-regulated on KbLow T cells stimulated with Con A or anti-CD3 plus anti-CD28 (Table III⇓). Kq expression on KbLow T cells, however, was up-regulated under these conditions indicating that transcription factors regulating class I gene expression were induced. KbHigh T cells, FVB-Kb splenocytes, as well as unsorted splenocyte/lymph node cell populations from KbTc mice all appear to up-regulate both Kb and Kq expression when stimulated with Con A or anti-CD3 plus anti-CD28 cross-linking. This finding indicates that in differentiated peripheral T cells, the KbTc locus is assessable to transcription factors that up-regulate the endogenous Kq gene. Unsorted T cell populations were triggered to up-regulate transgene expression on a population of T cells indicating that KbTc cells are not producing a general inhibitor of transgene expression. The finding that Kb transgene expression does not completely correlate with the expression of other known T cell activation or memory markers suggested that the transgene is serving as a marker of genetic events which were different from those identified by other differentiation markers. Therefore, it was of interest to determine the genomic locus where transgene integration had occurred. Using FISH, we determined that the transgene had integrated into chromosome 1 (Fig. 7⇓A). Using a Giemsa stain for banding patterns of chromosome 1, we further identified the integration site near bands E2 and E3 (Fig. 7⇓B). The Kb transgene integrated into chromosome 1, between band D and E2. A, FISH analysis of metaphase chromosomes from FVB- KbTc mice. Plasmid DNA containing the full-length Kb transgene was fluorescently labeled and hybridized to a metaphase spread (upper left panel). Spectral karyotyping of the same metaphase spread (upper right panel) identified each chromosome. The lower left panel shows the classified karyotype of the metaphase spread shown in the upper panels. This metaphase spread is representative of several metaphase spreads. Hybridization occurred on both 17 and chromosome 1. Hybridization on chromosome 17 was thought to be due to the fact that the endogenous class I locus is located on chromosome 17, and Kb and Kq share a high degree of homology in their genomic sequences. B, Metaphase spreads were stained with a Giemsa stain (right) to determine the banding patterns of chromosome 1. The same metaphase spreads were stained with a Kb-specific probe as described above (left). A comparison of the two images reveals that integration has occurred in band E2 or E3 of chromosome 1. C, Microsatellite mapping established a 4.6-cM interval in which the transgene has integrated. Polymorphic microsatellite sequences are convenient markers for mapping a gene within the genome. We used this technique to confirm that the Kb transgene integrated on chromosome 1 and to determine an interval containing the integration site. FVB-KbTc mice were crossed with BALB/c mice, and the resulting F1 animals were backcrossed to BALB/c or DO11.10 mice. Backcross offspring were phenotypically characterized for expression of the Kb transgene and genotyped at various microsatellites along chromosome 1. We confirmed that the transgene had integrated on chromosome 1 by finding a statistically significant association of Kb expression with an FVB genotype at D1Mit139 on chromosome 1 (p < 0.001). By using multiple microsatellite markers, we found that 10 backcross offspring had undergone chromosomal recombinations on chromosome 1. By correlating Kb expression with the genotypes of these recombinant mice, we were able to establish an interval in which the transgene must be integrated (Fig. 7⇑C). Specifically, one transgene-negative backcross offspring had an FVB genotype at D1Mit365, but had a BALB/c genotype at D1Mit191. Therefore, we knew that the transgene must have integrated downstream of D1Mit365. Another backcross-negative offspring’s genotype was BALB/c at D1Mit365, but FVB at D1Mit191, indicating that the integration event must have occurred upstream of D1Mit191. Microsatellite loci between D1Mit365 and D1Mit191 were not found to be polymorphic between FVB and BALB/c strains of mice, so we have not been able to use this strategy to narrow the region containing the transgene integration site further. Next, we addressed whether Kb transgene expression correlated with the expression of genes between D1Mit365 and D1Mit191 on chromosome 1 that were known to be associated with T cell biology. The regulatory mechanisms mediating expression of known T cell-related genes might also regulate genes at the transgene integration site. The genes encoding PD-1 and Bcl-2 have been mapped to this region. PD-1 is expressed by activated T cells and functions in the negative regulation of T cell responses (24, 25). Expression of the antiapoptotic molecule Bcl-2 by T cells is dynamic; activated T cells express lower levels of Bcl-2 than do naive and memory T cells (26, 27, 28). We compared the expression of these genes in KbHigh and KbLow T cells. RNA was fractionated from KbHigh and KbLow T cells on 3 separate days and was hybridized to six different Affymetrix mouse 430A gene chips (three with KbHigh RNA and three with KbLow). The Affymetrix analytical tools determines the level of expression based on the signal generated from hybridization, and associates a “present” call with a gene whose signal is determined to be above background and an “absent” call for genes whose expression is not above background. Comparisons of gene expression were made between three independent KbHigh and KbLow RNA preparations. The hybridization analysis indicated that PD-1 and Bcl-2 expression did not associate with Kb expression (Table IV⇓). Therefore, even though these two genes map within the 4.6-cM interval marked by the Kb transgene, the transgene is marking regulatory events that do not extend to the PD-1 and Bcl-2 loci. Other groups have shown that activated T cells, in comparison to naive or memory T cells, express higher levels of cell cycle-related genes (4, 6). Gene chip analysis of transcripts expressed by KbHigh and KbLow T cells revealed that there is no difference in expression of cell cycle-related genes such as histone 3 or cyclin A, B, C, or E. However, in comparison to KbLow T cells, KbHigh T cells displaying higher expression levels of genes associated with effector functions, such as granzyme A, MIP1-β, and RANTES were noted (Table IV⇑). The fact that KbHigh T cells express effector molecules, yet do not express genes that are associated with cell proliferation, suggests that transgene expression is associated with cellular differentiation rather than cellular activation. This is further supported by the fact that cross-linking CD3 and CD28 does not induce up-regulation of the Kb transgene in KbLow T cells (Table III⇑). In this study, we describe the FVB-KbTc mouse in which expression of a MHC class I Kb transgene can be used to distinguish between peripheral naive and primed/memory T cells. As mature T cells exit the thymus, they express low levels of the Kb transgene (Fig. 2⇑). Surface expression of Kb associates with the expression of activation and memory-associated markers (Figs. 3⇑ and 4⇑). Long-lived memory T cells of the KbHigh phenotype proliferate robustly and rapidly produce cytokines (Figs. 5⇑ and 6⇑). Furthermore, up-regulation of transgene expression appears to involve signals that result from engagement of the TCR together with other, yet undefined signals (Table II⇑). Others have shown that activated and memory T cells, in comparison to naive T cells, express higher levels of cell cycle-related and effector function-related genes (4, 5, 6, 29). Our gene chip analysis of transcripts expression by KbHigh and KbLow T cells revealed that there is no difference in expression of cell cycle-related genes such as histone 3 or cyclin A, B, C, or E. However, in comparison to KbLow T cells, KbHigh T cells express higher levels of genes associated with effector functions, such as granzyme A, MIP1-β, and RANTES (Table IV⇑). Transgene expression may be a marker of previous exposure to Ag, and due to the fact that KbHigh and KbLow T cells in this analysis were isolated from resting animals, Kb expression may be marking memory T cell populations. In any case, transgene expression in these animals appears to be marking T cells that have undergone differentiation events that distinguish them from naive T cells. Previous attempts to use transgenic models to distinguish activated from memory T cells used the cre-recombinase gene driven by a truncated granzyme-B promotor to induce expression of a marker gene only in activated and memory T cells (30, 31). Expression of this granzyme-B promotor is restricted to activated T cells (32). In our system the Kb transgene is under its endogenous promotor yet appears to be regulated by the structure of chromatin at the integration site which changes as T cells transition from naive to a primed or memory state. Therefore, transgene expression in our system is marking a unique event normally occurring during T cell differentiation. Based on its correlation with expression of CD44 and CD62L, transgene expression can be used to distinguish naive from activated/memory T cells. Maris et al. (31) generated a transgenic mouse in which activated T cells are permanently marked by expression of β-galactosidase (β-gal). In their model, half of the β-gal+CD8+ population was CD44low, indicating that CD44 expression did not mark all previously activated cells. They argued that the mechanisms regulating β-gal and CD44 expression must not be the same. Similarly, transgene expression in the FVB-KbTc mouse correlates with up-regulation of CD44, but the expression patterns of the two markers did not completely overlap (Fig. 3⇑). In the KbTc mouse transgene expression cannot be used to distinguish between activated and memory T cells because it does not correlate with the expression of other activation/memory markers (Fig. 4⇑). We conclude that the transgene is marking T cell development stages in other than those identified by up-regulation of traditionally defined markers. The genetic events regulating expression of the transgene are shared by CD4+ and CD8+ T cells. CD4+ and CD8+ T cells differ in the kinetics and magnitude of Ag-induced proliferation and expansion, the acquisition of effector functions, and the costimulatory requirements for activation (33). However, they share a requirement for TCR-specific signals and costimulation that lead to proliferation and clonal expansion, as well as differentiation into effector or memory cells. It is unlikely that mechanisms mediating CD4+- or CD8+-specific differentiation are responsible for the FVB-KbTc phenotype. When stimulated in vitro with Con A or anti-CD3 plus anti-CD28 cross-linking Abs, purified KbLow T cells fail to up-regulate Kb expression (Table III⇑). Therefore, transgene up-regulation may be regulated by signals other than those mediated through the TCR or those that direct the cell to proliferate. For example, transgene up-regulation may be driven by signals mediated by cytokine receptors or costimulatory molecules that arise on APCs late during activation. Nevertheless, TCR-mediated signals do appear to be necessary for transgene expression (Table II⇑). We are currently addressing these possibilities as requirements for transgene up-regulation, as these requirements may give us clues to the mechanisms resulting in differential transgene expression. Our current hypothesis is that the transgene has integrated into a region of chromosome that is tightly folded into heterochromatin in thymic T cells and naive peripheral T cells. Whether this is a locus-specific regulatory phenotype, or a structural feature of several areas of chromatin throughout the nucleus of naive T cells is not yet known. When T cells encounter Ag and differentiate into effector cells, signals are generated to convert heterochromatin into euchromatin, opening access to the underlying DNA to transcription factors that govern gene expression. Because class Ia genes are normally expressed in T cells, the required transcription factors are already present in naive T cells. Opening the chromatin structure provides access for these factors to the transgene’s promotor and enhancers and is all that is needed to allow expression of the surrogate marker of differentiation. A similar event may be occurring at the PD-1 locus where differentiation is accompanied by increased accessibility of the locus following in KbHigh cells, as evidenced by increased cryptic transcription. However, in keeping with the notion that KbHigh cells are not activated, expression of the activation marker PD-1 remains very low (Table IV⇑), despite the increased accessibility of the locus (presumably because essential transcription factors are not present). We are currently using methods other than microsatellite mapping to identify the transgene integration site, and have been able to determine that the full-length Kb gene was integrated into chromosome 1 (C. Sloma, unpublished observation). This supports our hypothesis that regulation of transgene expression in the FVB-KbTc mouse is not a function of the transgene itself, but rather a property of the regulation of genes at the transgene integration site. Elucidation of the gene regulatory events governing expression of the locus marked by the transgene may reveal regulatory elements that are exclusively used by T cells and may help define differences between naive, activated, and memory cells. Delineating the mechanisms that regulate the transition of naive T cells to a differentiated memory state is fundamental to understanding the cellular immune response. We thank Tad Trejo (Mayo Transgenic Animal Core Facility) for assistance with the generation of the FVB-Kb transgenic mice, Kari Hafner, and Mark Law (Mayo Cytogenetics Lab) for technical assistance with FISH experiments, and Michelle Hoeltzle (Mayo Microarray Core Facility) for technical assistance with gene chip experiments. We also thank Dr. Alexey Leontovich (Mayo Microarray Core Facility) for guidance with analysis of gene chip data. ↵1 This work was supported by National Institutes of Health Grants NS38468 and AI007425. ↵3 Abbreviations used in this paper: DC, dendritic cell; FISH, fluorescence in situ hybridization; β-gal, β-galactosidase. Kisielow, P., H. von Boehmer. 1995. Development and selection of T cells: facts and puzzles. Adv. Immunol. 58: 87-209. Dutton, R. W., L. M. Bradley, S. L. Swain. 1998. T cell memory. Annu. Rev. Immunol. 16: 201-223. Schluns, K. S., L. Lefrancois. 2003. Cytokine control of memory T-cell development and survival. Nat. Rev. Immunol. 3: 269-279. Teague, T. K., D. Hildeman, R. M. Kedl, T. Mitchell, W. Rees, B. C. Schaefer, J. Bender, J. Kappler, P. Marrack. 1999. Activation changes the spectrum but not the diversity of genes expressed by T cells. Proc. Natl. Acad. Sci. USA 96: 12691-12696. Kaech, S. M., S. Hemby, E. Kersh, R. Ahmed. 2002. Molecular and functional profiling of memory CD8 T cell differentiation. Cell 111: 837-851. Cham, C. M., H. Xu, J. P. O’Keefe, F. V. Rivas, P. Zagouras, T. F. Gajewski. 2003. Gene array and protein expression profiles suggest post-transcriptional regulation during CD8+ T cell differentiation. J. Biol. Chem. 278: 17044-17052. Haskins, K., R. Kubo, J. White, M. Pigeon, J. Kappler, P. Marrack. 1983. The major histocompatibility complex-restricted antigen receptor on T cells. I. Isolation with a monoclonal antibody. J. Exp. Med. 157: 1149-1169. Marrack, P., R. Shimonkevitz, C. Hannum, K. Haskins, J. Kappler. 1983. The major histocompatibility complex-restricted antigen receptor on T cells. IV. An antiidiotypic antibody predicts both antigen and I-specificity. J. Exp. Med. 158: 1635-1646. Radhakrishnan, S., L. T. Nguyen, B. Ciric, D. R. Ure, B. Zhou, K. Tamada, H. Dong, S. Y. Tseng, T. Shin, D. M. Pardoll, et al 2003. Naturally occurring human IgM antibody that binds B7-DC and potentiates T cell stimulation by dendritic cells. J. Immunol. 170: 1830-1838. Jalal, S. M., M. E. Law. 1999. 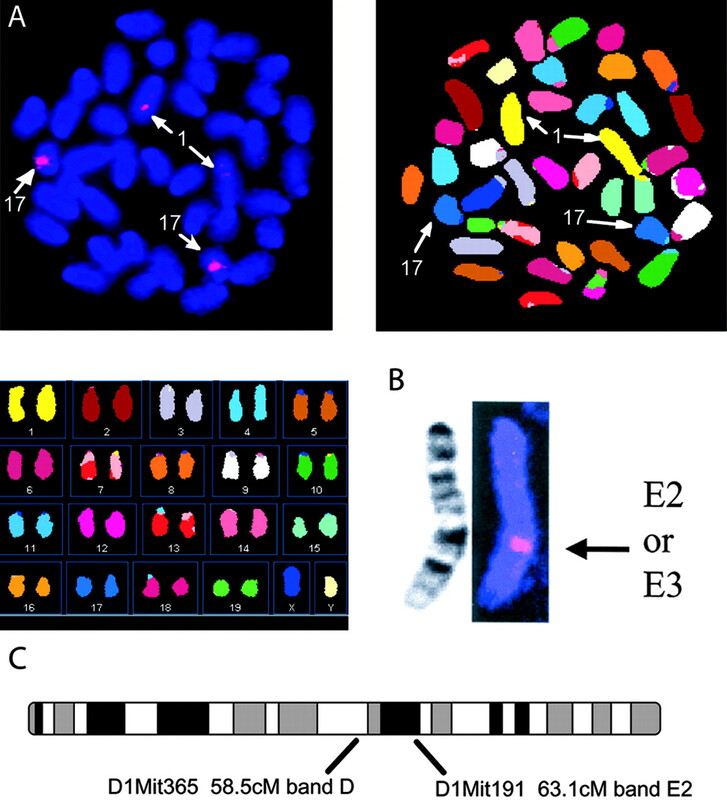 Utility of multicolor fluorescent in situ hybridization in clinical cytogenetics. Genet. Med. 1: 181-186. Lee, W. T., X. M. Yin, E. S. Vitetta. 1990. Functional and ontogenetic analysis of murine CD45Rhi and CD45Rlo CD4+ T cells. J. Immunol. 144: 3288-3295. Lee, W. T., J. Cole-Calkins, N. E. Street. 1996. Memory T cell development in the absence of specific antigen priming. J. Immunol. 157: 5300-5307. Budd, R. C., J. C. Cerottini, C. Horvath, C. Bron, T. Pedrazzini, R. C. Howe, H. R. MacDonald. 1987. Distinction of virgin and memory T lymphocytes: stable acquisition of the Pgp-1 glycoprotein concomitant with antigenic stimulation. J. Immunol. 138: 3120-3129. Bradley, L. M., D. D. Duncan, S. Tonkonogy, S. L. Swain. 1991. 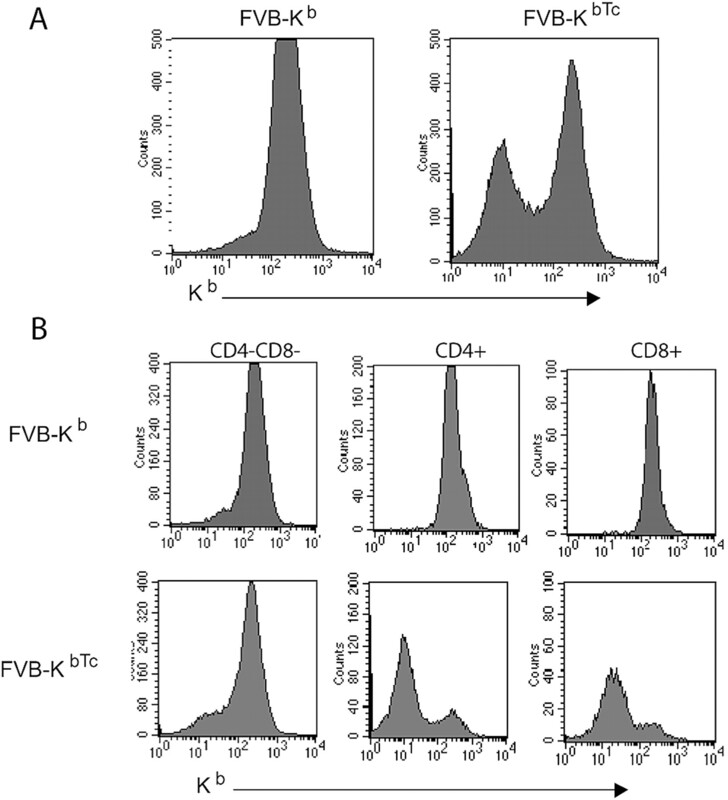 Characterization of antigen-specific CD4+ effector T cells in vivo: immunization results in a transient population of MEL-14-, CD45RB- helper cells that secretes interleukin 2 (IL-2), IL-3, IL-4, and interferon γ. J. Exp. Med. 174: 547-559. Sprent, J., C. D. Surh. 2002. T cell memory. Annu. Rev. Immunol. 20: 551-579. Cho, B. K., C. Wang, S. Sugawa, H. N. Eisen, J. Chen. 1999. Functional differences between memory and naive CD8 T cells. Proc. Natl. Acad. Sci. USA 96: 2976-2981. Walunas, T. L., D. S. Bruce, L. Dustin, D. Y. Loh, J. A. Bluestone. 1995. Ly-6C is a marker of memory CD8+ T cells. J. Immunol. 155: 1873-1883. Bunce, C., E. B. Bell. 1997. CD45RC isoforms define two types of CD4 memory T cells, one of which depends on persisting antigen. J. Exp. Med. 185: 767-776. Rogers, P. R., C. Dubey, S. L. Swain. 2000. Qualitative changes accompany memory T cell generation: faster, more effective responses at lower doses of antigen. J. Immunol. 164: 2338-2346. Hurst, S. D., S. M. Sitterding, S. Ji, T. A. Barrett. 1997. Functional differentiation of T cells in the intestine of T cell receptor transgenic mice. Proc. Natl. Acad. Sci. USA 94: 3920-3925. Macatonia, S. E., N. A. Hosken, M. Litton, P. Vieira, C. S. Hsieh, J. A. Culpepper, M. Wysocka, G. Trinchieri, K. M. Murphy, A. O’Garra. 1995. Dendritic cells produce IL-12 and direct the development of Th1 cells from naive CD4+ T cells. J. Immunol. 154: 5071-5079. Saparov, A., L. A. Kraus, Y. Cong, J. Marwill, X. Y. Xu, C. O. Elson, C. T. Weaver. 1999. Memory/effector T cells in TCR transgenic mice develop via recognition of enteric antigens by a second, endogenous TCR. Int. Immunol. 11: 1253-1264. Jenkins, M. K., A. Khoruts, E. Ingulli, D. L. Mueller, S. J. McSorley, R. L. Reinhardt, A. Itano, K. A. Pape. 2001. In vivo activation of antigen-specific CD4 T cells. Annu. Rev. Immunol. 19: 23-45. Agata, Y., A. Kawasaki, H. Nishimura, Y. Ishida, T. Tsubata, H. Yagita, T. Honjo. 1996. Expression of the PD-1 antigen on the surface of stimulated mouse T and B lymphocytes. Int. Immunol. 8: 765-772. Dong, C., R. I. Nurieva, D. V. Prasad. 2003. Immune regulation by novel costimulatory molecules. Immunol. Res. 28: 39-48. Grayson, J. M., K. Murali-Krishna, J. D. Altman, R. Ahmed. 2001. Gene expression in antigen-specific CD8+ T cells during viral infection. J. Immunol. 166: 795-799. Grayson, J. M., A. J. Zajac, J. D. Altman, R. Ahmed. 2000. Cutting edge: increased expression of Bcl-2 in antigen-specific memory CD8+ T cells. J. Immunol. 164: 3950-3954. Garcia, S., J. DiSanto, B. Stockinger. 1999. Following the development of a CD4 T cell response in vivo: from activation to memory formation. Immunity 11: 163-171. Swanson, B. J., M. Murakami, T. C. Mitchell, J. Kappler, P. Marrack. 2002. RANTES production by memory phenotype T cells is controlled by a posttranscriptional, TCR-dependent process. Immunity 17: 605-615. Jacob, J., D. Baltimore. 1999. Modeling T-cell memory by genetic marking of memory T cells in vivo. Nature 399: 593-597. Maris, C. H., J. D. Miller, J. D. Altman, J. Jacob. 2003. A transgenic mouse model genetically tags all activated CD8 T cells. J. Immunol. 171: 2393-2401. Hanson, R. D., G. M. Sclar, O. Kanagawa, T. J. Ley. 1991. The 5′-flanking region of the human CGL-1/granzyme B gene targets expression of a reporter gene to activated T-lymphocytes in transgenic mice. J. Biol. Chem. 266: 24433-24438. Seder, R. A., R. Ahmed. 2003. Similarities and differences in CD4+ and CD8+ effector and memory T cell generation. Nat. Immunol. 4: 835-842.